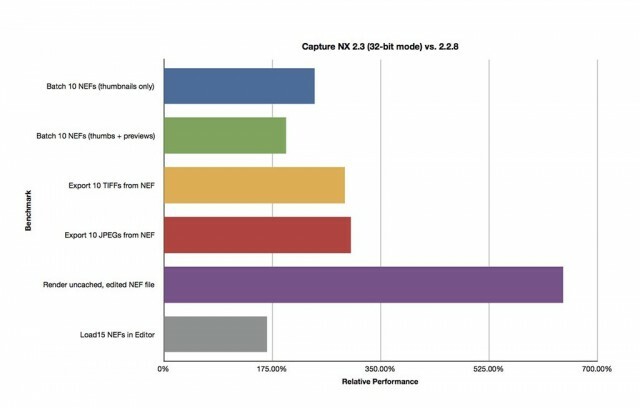 Nikon has just announced the immediate release of Capture NX2 version 2.3. This is a major update to the software, as not only does it include numerous bug fixes, but it also offers native 64-bit processor support. It also offers native Mac OS X 10.7 (Lion) support. I had the opportunity to run a series of performance benchmarks, and I’ll also address the new features and caveats of upgrading. 64-bit native support on Mac and Windows operating systems. This translates into massive speed improvements (see benchmarks, below). Better support for Nikon 1-series cameras and the Nikon Coolpix P7100. “Astro Noise Reduction” mode, intended to help reduce color artifacts in long-exposures of night skies. See the full description of all new features and fixes at Nikon’s support page. 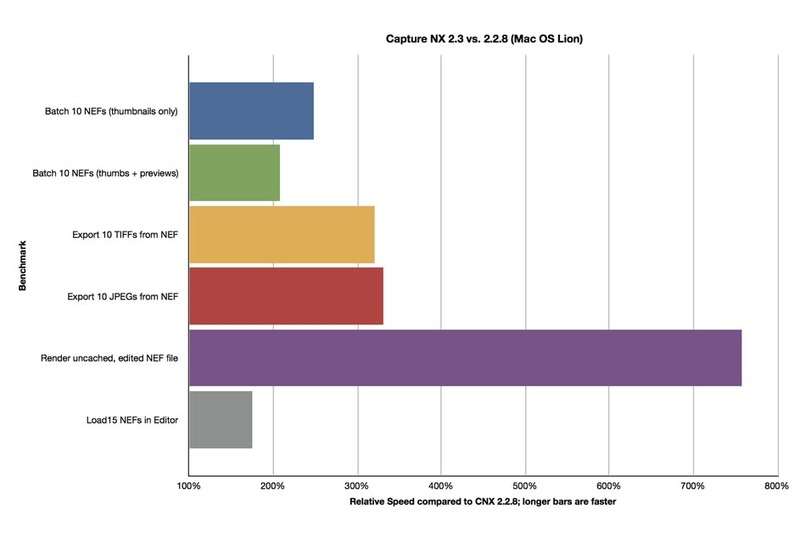 I benchmarked Capture NX2 2.3 against its predecessor, version 2.2.8, on my 6-core Mac Pro running Mac OS Lion and 24GB RAM. I also ran the same benchmarks running NX 2.3 in 32-bit mode on my Mac (more on this later). 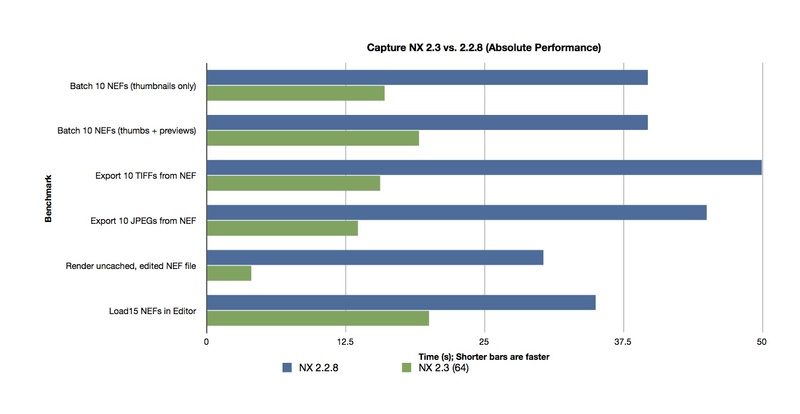 Across the board, Capture NX 2.3 is significantly faster than version 2.2.8. The best overall speed boost was in rendering previously saved, but uncached files. NX 2.3 rendered my file in 4 seconds, where 2.2.8 required over 30 seconds! That’s a speed boost of over 700%! TIFFs and JPEGs export three times faster compared to NX 2.2.8. That’s some major improvements. Loading 15 NEFs was a full 15 seconds faster in version 2.3. Click on any graph to view a larger version. Absolute performance of Capture NX 2.3 (64-bit) vs. 2.2.8. Times are in seconds, shorter bars are faster. Rendering embedded, full-resolution preview JPEGs does slow down NEF save times. You’ll get save times that are about 20% faster by disabling the preview JPEGs. However, keep in mind that if you don’t embed a preview JPEG, programs like Photo Mechanic will not have the ability to quickly preview your edited NEF. Seeing as how NEF batching is twice as fast in NX 2.3 compared to before, I usually leave the thumbnail option on. On the Mac, you can run CNX 2.3 as a 32-bit application if you so choose. This is critical for users who want to run Nik’s Color Efex Pro 3.0 within CNX2, as it is a 32-bit application. I compared Capture NX 2.3 against itself in both modes, and found modest improvements when running in 64-bit mode. However, even in 32-bit mode, CNX 2.3 is significantly faster than version 2.2.8. The biggest difference, as you may expect, is in memory usage. In 32-bit mode, NX 2.3 can only access 1.37GB of RAM. In 64-bit mode, it used 3.42GB of memory to handle 15 NEFs opened simultaneously. If you like to open LOTS of files at the same time, this is a big help. Otherwise, the overall speed differences between 32-bit mode and 64-bit mode are fairly small. Clearly, Nikon has improved the overall code in the CNX2 engine to make it run much, much faster than before. Performance differences between Capture NX 2.3 (32-bit) vs. 64-bit mode. 1) For best results, make sure you have already installed CEP3 for Capture NX2 using version 2.2.8, then run the Capture NX 2.3 updater. You will need to use CEP 3.003 (available for registered users by logging in to your account at www.niksoftware.com) because earlier versions are NOT COMPATIBLE with CNX 2.3. 2) Windows users: You will be asked during installation if you want to install the 32-bit version or the 64-bit version of CNX 2.3. This prompt should occur as long as CEP 3 was previously installed. Choose the 32-bit version if you wish to run CEP3 within Capture NX2. If you choose the 64-bit version, your plug-ins will not work. 3) Mac users: you can toggle between 32-bit and 64-bit modes after installing Capture NX 2.3. 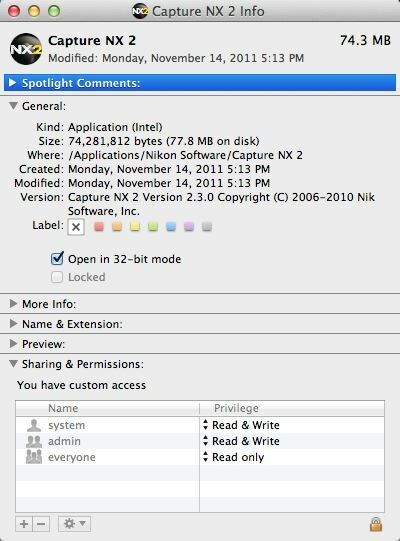 Right-click (or Ctrl-click) the Capture NX2 application icon and choose “Get Info.” Then check the “Open in 32-bit Mode” box and re-launch Capture NX2. Capture NX2 version 2.3 is a much-needed overhaul to Nikon’s RAW conversion/editing software. It’s really fast, and I haven’t been able to crash it doing typical image editing. I am, however, disappointed that there are really no new features, and it’s too bad that we have to make compromises to run Color Efex Pro 3 (the only native plug-in for Capture NX2). However, this update absolutely breathes new life into my RAW converter of choice. It’s faster, more robust, and works far better than previous versions of Capture NX2. While this update is long overdue, I’m happy it’s here, and I will continue to use it for my fundamental image processing. Unfortunatly, I am no more able to use Efex Pro 3.0 even when using the 32 bits version. Thanks for the update. Now to test it out with my workflow! Hope that CEP4 will soon work with NX2.3!!!! I’ve been testing the Mac version for some time, and I haven’t had these problems. Hopefully, a fix will be implemented to address them. NX2 was and still is very good on my win7 64bit PC and does not have issues. However on my new mac I have had endless trouble and preferred working on the pc. Now with the new update 2.3 it is rock solid on the mac and a pleasure to use as long as I stay in 64bit. The moment I switch back to 32bit and use one of the filters in COL efex pro it shuts down. So Color effex pro is un usable any way but at least NX2 is now fast and reliable and most of my favorite in Color effex I can reproduce myself in NX2 and save as setting for later use. The biggest noticeable speed increase is saving after a long series of adjustments and opening files that have been previously edited. Applying the healing tool on large areas is also much faster. The only new feature in view nx that I would like to see in future is full res side by side comparisons of images like you get in Faststone. Thank you for your answer. It may be specific from the Windows version. I did not have any confirmation for this possibility yet. I hope that Nikon will be reactive on this issue. I wish I knew. I think it’s kind of up to Nikon. Super review! Thanks for the quick posting. Off topic: Jason, When are you using 24 GB of RAM? I’m looking to build a Win 7 machine with 8 GB. I noticed CNX 2.3 used just under 4 GB under a load. Any insight into the new ‘astro noise reduction’ feature? Once again Nikon demonstrates that a software company they are not. I’m guessing that they farmed this out to the lowest bidder. Allowing a simultaneous install of the 32 and 64 bit versions, ala Adobe CS5, would have prevented this fiasco. Too bad they just don’t seem to get it. Same experience here. Much faster than the previous version. Good to see that my favourite tool is still being developed and improved. Things work really fast in 64 bit mode (which is nice). Note that if you open an image which had a Color Efex filter applied, you get a edit step saying there was an enhancement applied that is not on your computer…. Which filter? I didn’t seem to have that many issues. I have the 24GB RAM for running multiple applications and Photoshop. After trying a bunch of different ways to get CNX2 ver2.3 to work with Nik CEP3, in 32bit mode, I had all but given-up… till I tried the suggestion in the below link. Yes it worked!!! You’ll want to add the note to your Review, if you are running Windows 7 and choose to *upgrade* CNX2 in-place rather than do a complete uninstall and reinstall, you will NOT get a choice of 32 or 64 bit. The installer automatically gives you 64-bit. This is confirmed when checking Task Manager – the process is not running under 32-bit WOWEXEC. A definite caution for CEP users. Thanks, Armando… strange, though, because I asked the Nik folks the recommended procedure for installing it, and that’s what they told me. The original version was 64-bit only… it was only after the beta testers raised hell with Nikon that they gave us this workaround at all. Make sure you have the most recent version of CEP 3 for CNX2… version 3.0.3, I believe. Log in to your Nik Software account and make sure you have CEP 3.0.3. That’s the fix. I can’t believe the update won’t read my 2.25 license automatically. I still had the older version on another HD and I thought I’d just take my license # off of that and re-register the new version – but the format has changed! My old license is in the format xxxxx xxxxx xxxxx xxxxx and the new format has FIVE boxes to enter numbers. Any ideas on overcoming this? Yes, contact Nikon technical support directly. Thanks for the tip about upgrading Color Efex Pro.. It did the trick! Now the only weirdness was that when installing version 2.3, it asked not only for my NX2 serial number, but also the serial number for the original NX version one!! I am glad I was able to find that!!! The format of the product key hasn’t changed. The key that is displayed on the about screen isn’t the same as the one that you type in. This is to stop people from stealing product keys from the screen. You need to go back to your box or email from when you bought the software and find the key. This will be in the correct format with 5 groups of numbers. Jason, thanks for the suggestion of upgrading Color Efex. It works fine. Jason – Thanks for the write-up. I had no problems with a normal installation on Windows 7 64 bit. I did not ahve ot uninstall and got the dialogue box with the 32 bit option as the default. Your write-up refers to CEP 3.0.3. I thought I was up to date, but went to teh Nik site. The version I saw was 3.003 . Is that correct? I’m running Capture NX2 2.3 with CEP 3.003 without any issues. The View NX2 upgrade seems to work fine as well. If you are using ViewNX2, don’t install the 64-bit version. You cannot call a 64 bit app from a 32 bit app, but you can call a 32 bit app from a 64 bit app…if written properly. This is really half-fast. It makes me wish I hadn’t spent 30 years in software development. Wrong again…I hate when that happens. You must redefine CNX2 to VNX2 since the program directory has changed. Eric- I think you’re right… 3.003. I’ll update the article accordingly. Still nx 2.3 appears to be customer unfriendly. I have not used since original vesion 1. Not worth the wasted time. Any product that is an aggrevation I stay away from. Thanks for the review / performance comparison. Very useful. I was having the same issue of CEP 3 for CNX2.3.0 crashing CNX2. (Win 7 64-bit and CNX 2.3.0 32-bit.) After upgrading to CEP 3.003 for CNX2 the crashes are gone. My license keys won’t work on the 2.3 upgrade on my MacBook Pro. Am awaiting a “decision” from Nikon after sending in owner info including jpg of me holding both NX and NX2 upgrade discs with product key numbers clearly visible. Unfortunately I can’t test it out since my old serial # from 2.2.8 does’nt seem to work in version 2.3.0. Has anyone else had trouble installing the update? Yeow! Much improved on an iBook, OSX 10.6.8, 8gb RAM. I’ve been waiting for this—in more ways than one—for a long time. Found out from Nikon Cana that they have software glitch in the upgrade and ask me to try downloading and installing tomorrow. Seems like they can’t put this on their website. @Bill Millhollen: Fine! Can you tell us why we should know your frustration? You are wasting OUR time! Hi Jason, thanks for the info on the CFX Pro version upgrade and the 32bit check box. Everything now works beautifully on my Mac. It’s great to be free of the crashes using the selection brush and the increased speed is wonderful. It’s still a great programme for post adjustments. Let’s hope the system soon talks to CFX Pro4. Great review. I have Installed 2.3 and use Colour Efx. I was surprised that Nik Colour efx will not run in 2.3. I have a ton of photos that I have used the the filters in, all commercial work, and now when I open the files and see the finished process files in raw, the effects are gone! BUMMER. My walk around is to un-install 2.3 and go back to the older versions. When will Nikon learn and spend the extra bucks and go about it the right way. I am able to process my NEFs with CEP3 in CNX2 if I want to with no problems. The performance difference between 32-bit and 64-bit is fairly minor in CNX 2.3. Hi Jason, on my MacBook Pro NX2.3 will not open any files when in 64-bit mode, I get this error “Cannot load file: Macintosh HD/Users/gunterpichler/Client Images/2011/GWLRA/Corporate Photos/GWL_001.NEF”, everything works fine in 32-bit, any thoughts on that ? Remove them and try running 64-bit again. thanks for the great article. My 2.3 and CEP3 are running great! I do want to point out that I had no issue updating CEP 3.003 AFTER upgrading NX to 2.3 at 32 bit on my Mac. Please let me know if you have any other ideas, thanks. I like the speed improvements and lack of crashing in Capture NX 2 v2.3. However, as others have mentioned, it’s unfortunate that Nik and Nikon have not coordinated this release so that 64-bit versions of Color Efex Pro and Capture NX2 work together. Having access to both a 64-bit RAW converter and 64-bit versions of the Nik software collection is the primary reason I stopped using Capture NX2 and switched to Photoshop. I will gladly switch back to Capture NX2 when these issues are resolved. So Nikon Capture is faster now….Tooooo late. I gave up on it years ago……. Thanks for the info, very helpful. First I had CNX2.8 installed. Can I still find CNX2.6 on line, and where can I find CEP 3.003 update. Thaks again as these two programs ahe a big key to my workflow. Hello, Jason, and thanks for the review. I just yesterday found out about, and installed 2.3. The only thing that bugs me is the fact that when it opens, CNX2 takes up ALL the monitor real estate, with no apparent means of reducing the size of it. Are you experiencing this, or did I just forget it did the same thing in 2.2.8? Otherwise, I’m quite impressed with performance improvements. Jason, thanks for the review. I have installed 2.3 on my Windows 7 system and so far like it with one exception. When I right click on a jpeg or tiff file and then click on “open with”, NX2 is no longer shown as an option. With a NEF file NX2 is shown as an option. To open a jpeg or tiff, I must first open NX2 and go to “file, open” and then navigate to the file. Any idea what is causing this problem? Great writeup Jason, thanks loads for the information and update. Question though – how does this fit in with what we have all hoped for, a totally new “NX3”? Most likely you need to reset the Windows default filetype associations so that it knows to open a NEF with CNX2 by default. I own Nik Color Efex Pro 3 Select [NOT Complete] for Capture NX2, and am trying to understand how to update to NX 2.3. I know that I need to use the 32-bit NX 2.3 application to maintain compatibility with CEP, and I understand that I am supposed to use version 3.003 of Color Efex Pro, but I can’t find a download of ver. 3.003 for Select version on Nik’s website (only 3.003 for Complete)? I can only find ver. 3.000 of Select, which I already have installed. Jason, thanks so much for doing this comparison. Downloaded the update, and been playing all day. Your results are echoed by mine. I am please at the performance. I was testing Aperture as an alternative, and while I will continue to use it am happy to continue using Capture NX2. I hope the tuning by NIK means that Nikon will invest in another version after they get through the recovery from the disasters of this year. Appreciate your blog, and advise. If you have 3.003 of the “select” version, you should be fine. I cannot find ver. 3.003 for CEP “Select” anywhere on Nik’s website, only the ver. 3.000 that I already have installed? Have Jason or others found 3.003 for CEP “Select”? Not very likely Nik will come with new versions. Look at their website: http://www.niksoftware.com/cepnx/en/entry.php? Nik’s lead developer has stated publicly that Nik are developing a 64-bit native update to CEP3. Thank you for your review, I appreciate it. My experience with the 2.3.0 update in 32-bit mode has been positive. However, I cannot get it to open NEF’s, TIFF’s and JPEG’s in 64-bit mode — I get an error message: ” Cannot open file: Macintosh HD1…”. Nikon tech support is clueless; in spite of all the screen shots, file and image submissions I’ve made, they still don’t seem to understand the problem (a situation I’ve noticed since Nikon went offshore to save on tech support). Everything I’ve tried on my own — completely removing NX2 and related files from my system, reinstalling NX2 from the original disk, updating to 2.2.8, installing 2.3.0 have been to no avail. My unit is a Mac Pro running OSX 10.6.8 with 12 Gb memory. Jason, if you have any suggestions to offer, I would be most appreciative. I’ve heard that if you have older Adobe color profiles, they can mess up CNX2 (don’t ask me why). They are likely in /Library/Application Support/Adobe/Color/Profiles (or an alias that points to said folder). Thank you for your response. I found these 2 files and deleted them, but to no avail. I installed ver. 2.3.0 on my MacBook Pro and it worked perfectly in 64-bit. I’m really baffled now. I’ll keep trying to working Nikon Support to figure this out. I have the same problem, waiting to hear back from Nikon, removing the older Adobe profiles does not help. I wonder if it is possible to install both the 32 bit and the 64 bit versions and run the 32 bit when I need CEP? Do you think that is possible? On Mac OS, you just toggle between modes as needed. On Windows, it might be possible to do a double-install, but I wouldn’t know how to do it. I found these 2 files and deleted them, but to no avail. I installed ver. 2.3.0 on my MacBook Pro and it worked perfectly in 64-bit. I’m really baffled now. I’ll keep trying to working Nikon Support to figure this out. Exactly the same problem. 64 bit runs well on Macbook Pro, only as 32 bit on year-old Mac Pro, both running 10.6.8. I have tried everything from deleting View NX2, uninstalling and reinstalling Capture NX2.30, etc. but to no avail. Thanks for a great review, Jason! I have the same exact issue as Bob D. Nikon Tech Support had me add a new Admin account- I just called it “Nikon,” and the software works properly in both 32- and 64-bit modes. They couldn’t explain why, nor could Apple. As a temporary fix, you may want to add another account. That does indeed work, thanks, Keith! However, that creates other problems (no email, no access to other programs, etc.). In the meantime, I’ll just get to know it Capture NX2 better and wait for a proper fix. Hi Jason, unfortunately Capture NX2 v2.3.0 has introduced two serious bugs: one in the JPEG encoder and the other in the processing of camera RAW data. The latter error makes my D700 NEFs look so totally different from the camera JPEGs that attempting to edit the NEFs is pointless. Nik Software has told me that I must deal Nikon; Nikon is not interested. If you are interested I’ll send you some examples. I’m not sure what might be going on, but I’ve had absolutely no issues to speak of using CNX 2.3. My files look as I’d expect them to, and exporting JPEGs works fine. Nikon is responsible for Capture NX2 support. Nik Software is only a development partner of Nikon. Fantastic! Thanks! I have a MacBook Air and this works perfectly! I don’t use CEP a lot but this option allows me to continue using it when I do need it. I’ve just installed CNX2 v2.3 on my iMac (Mac OS X 10.7.2). No problems have been encountered and as you say it does run much quicker and so far has been stable. Because V 2.2.8 was slow I was being pressurised to change to Lightroom 3, however, may not need to do so – time will tell. Thanks, Jason – appreciate the review of NX 2.3. A bit of a bummer that CEP 3.003 does not work in 64-bit mode, but I’ll take the 64-bit NX2 over the 32-bit version any time for performance (PC). Besides, I typically use NX2 for raw conversions only, with the rest of my workflow on CS5 using the full Nik suite (plus any other plugins and native CS5 work that makes sense). I only use CEP3 in NX2 on occasion for a quick edit or to play around a bit. So I can live without CEP3 on NX2 till Nik updates it. Again, thanks for the review – very helpful. I find your information so helpful. I have your Capture NX2 Guide (First Edition 2008 – I don’t know whether you allow updates, if we’ve purchased the .pdf), and a whole package of your video tutorials, and an extended one on sharpening. I am just learning to extend my knowledge of the 7,682 features on my Nikon D700 (and covetous of the new D4). I had just developed a CNX2 workflow that incorporated Photo Mechanic, but did not require CS5 (which I do not own), or LR3 (which I did get at $99). I saw the discount you offered on the bundle of Nik Software that includes CEP4, Silver Efex Pro 2.0, and HDR Efex Pro, and couldn’t resist. Do you have any workflow tutorials that offer suggested variants, based on your main raw processing software? Perhaps it’s a more basic question than most of your readers, but I find the combinations of options, and intermediate steps to share them a bit overwhelming. I would appreciate your perspectives on ways to use the best of what Nik software has to offer, in fewer steps, for those of us who want to stick to one raw processing tool, or two, at the most. I’m working on a 17″ MacBook Pro, with a 2.3 Ghz Intel 7 chip, 500GB SSD HD, an external 26″ monitor, and Promise 12TB RAID. I also have the i1 Match colorimeter from X-rite, and discovered that it is not compatible with OS X Lion. X-rite has a beta version that they say works with Lion, but it does not support dual monitor configurations (which is not disclosed until the end of the load). The symptom I see after calibrating both with the puck (that gear was $179, a few months ago, just before it became obsolete), is that the dominant screen will render a NEF in CNX2.3 normally. The secondary monitor (my laptop, in this case) appears as if a heavy blue filter is layered over the image. I checked settings in CNX2, I calibrated both monitors 3x – no change. The image appears normally if viewed through Adobe Photo Shop Elements, Adobe Bridge, or Light Room 3 on the laptop – just not via CNX2. Any suggestions? Jason – Thanks for the review. I enjoy your podcasts as well. I recently purchased my first Mac which is running Lion 10.7.2 and had been leary of installing CNX2 due to multiple known issues so am happy to see 2.3! I have Photoshop CS5.5 too, but in my opinion when it comes to photography there is no one program to rely on. CNX2 is simply better when it comes to NEF’s and I have finally accepted that multiple software programs are the way to go. Curious if you agree? thanks for these news, jason, let’s hope cep4 will be implemented on the new nx2.3 64bits platform. Check your preferences and make sure that you’ve enabled full-size embedded previews. That’s a new option in NX 2.3. Just a heads up that Nik Software has just released Color Effects Pro 3.0 for Capture NX2, Version 3.0.0.4. This is a 64-bit version of the software which integrates perfectly with Version 2.3.0 of Capture NX2. It happens the same to me on a Mac Mini Server with OS X 10.7.2, NX2 2.3.0. Tried with Photoshop CS5 and Niksoftware plugins and obtain the same blue “posterized” images of the nefs. Thanks very much for your performance review of Capture NX2 v2.3. until I disabled 64 bit mode and opened it in 32 bit mode. I have heard of some isolated incidents, but I’ve had no problem. There is a bug with JPEGs that have been saved from Photo Mechanic with stars/labels not opening in CNX2 64-bit mode. The workaround is to remove the Photo Mechanic specific end of file tags from metadata. Hi Jason, long time lurker of your site here (your NX2 ebook is how I learned NX2 a couple of years ago). I’m seeing that the default NX2 (v2.3) NEF conversion no longer matches the (embedded) JPG written by the camera. It is punchier with more contrast and different colors (slightly). I see one of your readers mentions it above, and I’ve seen it mentioned on several forums, but it usually gets written off as a color management issue, and I don’t think it is. Can you try a simple experiment? I’m curious to see if you can reproduce this. Take an out-of-camera NEF, and make a copy of it. Put the two NEFs in the same directory. Open the 2nd one with NX2 and tick the “quick fix” box, and then untick it. NX2 will allow you to save (will update embedded preview), even though you’ve made no “real” changes. Now compare the original unmodified out-of-camera NEF with the one just saved by NX2 (e.g. toggle between the full-screen versions of them n the PhotoMechanic browser, which is effectively comparing the OOC embedded JPG preview against the one created by NX2 on a NEF with *no* edits. I’m seeing major differences between them. I’m using D7000 NEFs if it matters. I’m pretty sure you can see the difference even between the full-screen preview of the OOC NEF and the initial rendering of it in the NX2 edit window. Can you reproduce this, using either approach? I’ve never had a discrepancy using this approach until v2.3. I think something has changed. I have not seen anyone formally address this issue. I’ve seen enough people mention it that I believe it is not a totally isolated thing, but I felt like if it were widespread more people would be talking about it. If you can reproduce it I would like to hear your thoughts on it. If it is true that NX2 default NEF conversion no longer matches the rendering of the camera’s JPG engine, then it takes away one of the main reasons I chose to use NX2 in the first place. I wanted my raw conversion starting point to simply match the OOC JPG, now I’m getting something else. Keep up the good work. I always learn something when I visit this site. Just one quick follow-up: What is even more disturbing is that it appears as if all my “developed” NEFs (edited with previous versions of NX2) now all look different if I open them and/or save in NX2 2.3. I can see a difference between the embedded JPG and what it looks like when I open the NEF in NX2. I also can demonstrate this by exporting a new JPG from an old developed NEF (without re-saving the NEF itself), then comparing the NEF and JPG. Not good. I’m not seeing that behavior at all. I tested out some images yesterday, and they look fine. Whatever differences there are are so minor that I can’t really tell. OK thanks, I appreciate you trying. It means I may have a somewhat isolated incident which means it’s going to be even harder to fix. The differences I’m seeing are definitely not minor. I’m seeing boosted saturation and contrast. I’m glad I have always save off a “baked” JPG (and sometimes TIF) when done with my NX2 NEF edits, otherwise I would have effectively lost all my editing work. For example, the boosted contrast is messing up my old portrait shots. There were a couple of threads in the Capture NX flickr group that looked promising (folks having similar issues) but there was no conclusion far as I can tell. Frustrating that it seems to have been introduced with the 2.3 update, just when it started to get good (due to speed, etc..). Perhaps I’ve inadvertently changed a setting somewhere, I’ll dig around in the preferences and in the Picture Control Utility. Hi Jason, if you are interested in what I am seeing, I attempted to characterize it more clearly in a post I made to the Flickr Capture NX group. In that post, there is a link to a small set of files that I believe illustrates a defect in NX2, but I would be very happy to be proven wrong. Further to my post on 4th Jan: thanks for sharing your findings and files, Chris. I’m having severe issues with version 2.3 and D700 NEFs. My night photography has been rendered useless by this version of NX2. To see the problems clearly, try ISO 3200, Active D-Lighting set to High, and examine the shadow areas: there are awful white dots of noise and the colours are completely wrong. You shouldn’t even consider using Active D-Lighting for long exposures on NEFs. Your settings are a recipe for noise (ISO 3200, ADL, etc). Sorry, Jason, I should’ve elaborated my reply. I know what you are saying is correct. Rather than write a lengthy technical report, I gave a simple example that clearly shows the difference between the camera JPEG and this version of NX2, which was not present in previous versions. Active D-Lighting that is one of the features in this version that is not being handled correctly, noise reduction is another. Both issues are even worse for the D300s at much lower ISOs. If the scene dynamic range is moderate and the ISO is “reasonable” the colour and tone issues are apparent, as Chris has demonstrated. When one starts to push the D700/D3 series with wide dynamic range night scenes, this issue and the white noise dots become intolerable, which did not happen with previous version of NX2. Although I don’t have the facilities to conduct exacting tests, I’ve thought of a repeatable and meaningful procedure that will demonstrate the issues very clearly. However, it would take me dozens of hours to perform the tests and write a report. Been there, done that in 2009 with Nikon UK in an attempt to resolve a different issue with NX2. I was congratulated for my report, which was sent to Nikon Europe. Weeks later the email reply clearly showed that Nikon Europe was fully incapable of understanding what LCH mode means and how it works. Luckily, the problem has finally been fixed as of version 2.3.0. I made the frightful mistake of assuming that the version control feature that NX2 gives to my NEFs would enable me to accurately recreate JPEGs that I’ve had published. The latest version of NX2 has shown how foolish I have been. I have seen some very minor differences between in-camera JPEG previews and rendered NEFs. I’ve seen incredibly small differences in contrast between embedded JPEGs from NX 2.2.x and 2.3… so small as to not be of any concern. What I haven’t tested (and I’m not sure if this would matter) is a comparison of a TIFF/JPEG rendered by NX 2.2.x and one rendered with the same settings in NX 2.3. I’ve looked at my D3s, D2x and D700 files, and don’t see anything alarming. Another long time follower of your very helpful work. I also wanted to report I’m one of those having this strange problem in that CNX2 2.3.1 works fine on my MacBook pro in both 64 and 32 bit modes, but will not open any imaging files on my iMac unless I am in 32 bit mode, both running 10.6.8. (The same was true of 2.3.0.) Nikon support has not be helpful. Perhaps they’ll note the number of such reports here. Otherwise the program is much improved, as you say. Thanks. Thanks for all of your helpful comments, hints, and your e-book for CNX2. I recently upgraded to 2.3.1 on a Mac (OSX 10.6.8), and I am now unable to assign labels and to load XMP/IMPT presets to a group of files in the new version. No problems with ViewNX2 in this regard, but it would be nice to be able to do these operations in CNX2. I’ve tried reloading the software to no avail. Thanks for any ideas on how to solve.